MacRumors tips us off to the fact that Apple has begun advertising the iPhone 5s in various magazines. Up until recently, there hasn't been much advertising in the way of the iPhone 5s. Indeed, most iPhone advertising over the past few weeks has focused on the iPhone 5c with a series of really great and delightful commercials. Apple has also been advertising the iPhone 5c heavily via billboards in large cities like Chicago, San Francisco and New York. 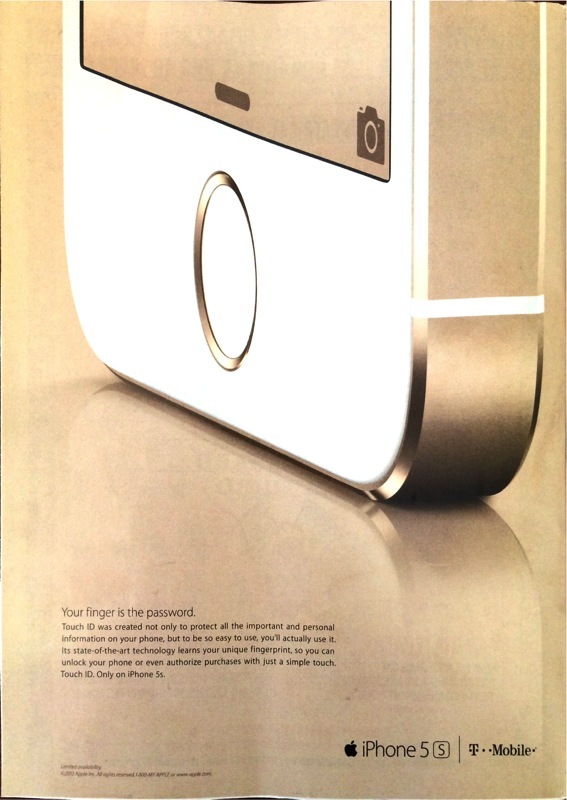 As for the 5s, MacRumors notes that the following ad appears on the back of this week's edition of The New Yorker. Your finger is the password. Touch ID was created not only to protect all the important and personal information on your phone, but to be so easy to use, you'll actually use it. Its state-of-the-art technology learns your unique fingerprint, so you can unlock your phone or even authorize purchases with just a simple touch. Touch ID. Only on iPhone 5s. It stands to reason that with the holiday shopping season slowly creeping up on us, Apple will soon begin to ramp up its iPhone 5s marketing. This is admittedly nothing more than speculation, but perhaps Apple has been slow to roll out iPhone 5s ads because supply continues to remain strained across the country. After all, if you take a look at the fine print in the advert above, you'll note that it says "Limited Availability" -- though perhaps that's in specific reference to the gold model. Similar ads have reportedly been spotted in other high circulation magazines such as Entertainment Weekly and Sports Illustrated. Apple begins marketing the iPhone 5s in magazines originally appeared on TUAW - The Unofficial Apple Weblog on Thu, 17 Oct 2013 20:00:00 EST. Please see our terms for use of feeds.